Google announced yesterday, which I covered at Search Engine Land, that they are now rolling out mobile-first indexing to "sites that follow the best practices for mobile-first indexing." So not all sites but only sites that are ready for switching over to the mobile-first indexing process. Don't call it the mobile-first index, but rather call it mobile-first indexing. The reason is that this is not a new separate index, Google said they "continue to have one single index that we use for serving search results." 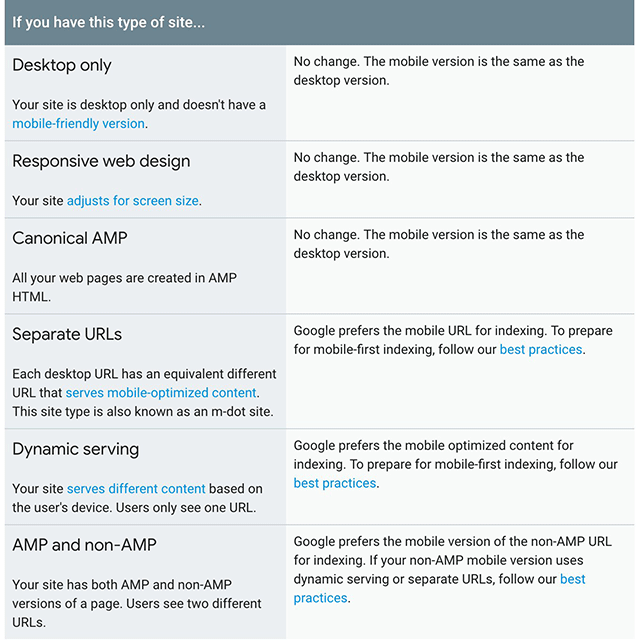 "We do not have a "mobile-first index" that's separate from our main index," Google added. This is why there is so much confusion - because of how we/they call it. It is about how they go about crawling and indexing the web. Before they crawled and indexed the web as a desktop browser would see the web page. Now with this change, Google is crawling and indexing the web as a mobile browser would see the web page. Google also said "site owners will see significantly increased crawl rate from the Smartphone Googlebot. Additionally, Google will show the mobile version of pages in Search results and Google cached pages." Google has published developer documents on mobile-first indexing best practices. Google shares here how to make sure your site doesn't suffer at all in terms of crawling, indexing and ranking when you are switched over to the new mobile-first indexing process. It's global - across countries & languages. I have yet to see any webmaster say they (a) got a notification about their site being enabled for the mobile first indexing and (b) them seeing their cache or other signals that their site has moved over. I checked dozens and dozens of mobile-friendly popular sites and saw no signs that they moved over yet. I know RankRanger thought the rollout was over a week ago, but that doesn't seem right. Finally, this is probably unrelated to the weekend Google algorithm update we covered that is not confirmed. Let me know if you see a cache show the mobile version of a site, that is a strong signal that site has moved over! I suspect once we see one in the wild, a bunch more will stop popping up like crazy.